We had a very exciting and productive in terms of cooking weekend. Slaninka and MM came over on Saturday. After a brief discussion and a quick consult with The America's Test Kitchen Family Baking Book, the decision was made, we were about to give a shot at the Eclairs :). It was Slaninka who was craving the most this exquisite and decadent dessert. Marulka joined us later for the final touches, photo-shoot, and tasting. Here is the team, Chef ( the capo di tutti Capi ) Slaninka, Sous Chef Lokuma, and Sous-Commis MM. First we started off with making the filling. 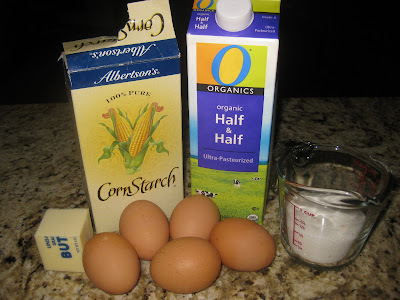 Bring the half-and-half, all sugar except 2 tbsp, vanilla and salt to simmer over medium heat. 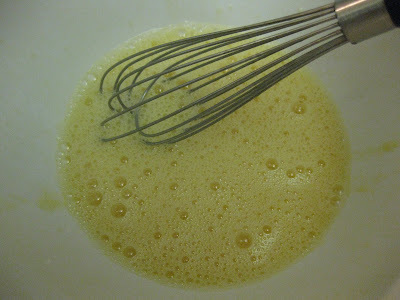 In a separate bowl whisk the egg yolks, 2 tbsp sugar and cornstarch until smooth. 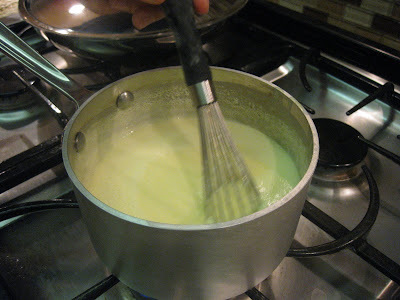 Carefully combine the hot mixture with the yolks, by first adding 1 cup from the hot mixture to the yolks. 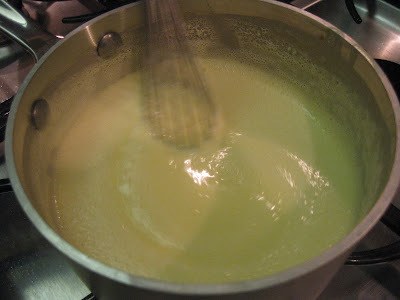 Whisking constantly simmer until few bubbles appear, about 30 seconds. 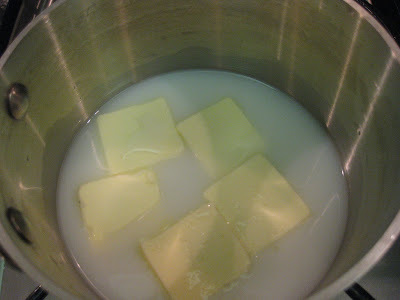 Off the heat add, the butter, cut into small pieces and whisk till it melts. 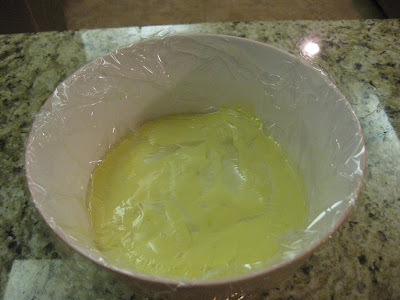 Transfer the pastry cream to a bowl and cover with plastic wrap. Keep in the fridge. Beat the eggs and the egg white in a bowl. 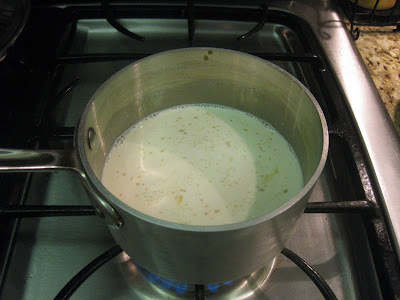 Bring water, butter, milk, sugar, and salt to a boil. Remove the sauce pan from the heat and stir the flour. Return the pan to the heat and cook for 3 minutes. Transfer the hot mixture to a food processor . With the machine running pour the eggs to the dough. Process for about 30 seconds until incorporated. 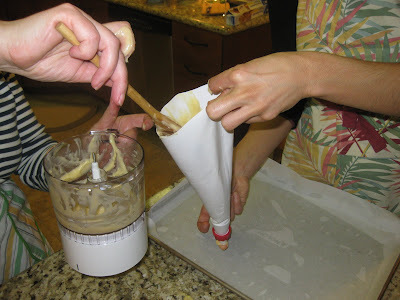 Fill a pastry bag with the dough and pipe the shells. Bake the pastries for about 15 minutes at 400F, then prop the oven door and reduce the heat to 350F. Bake for about 10 more minutes. 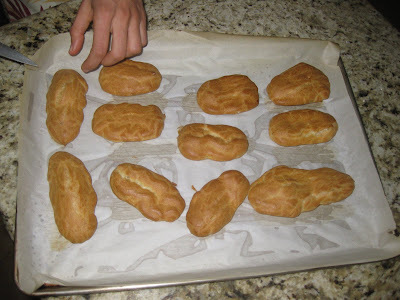 Remove the baking sheet from the oven and cut small slits into each pastry to release the steam. Let the pastries completely cool off. Fill the pastries with the filling. Bon Apetit! Indeed the best eclairs ever! 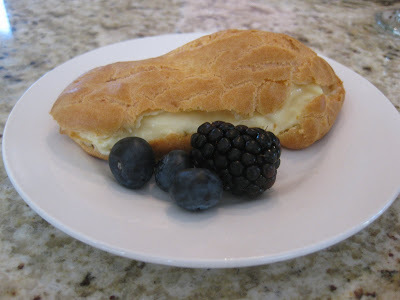 The pastry cream was very well balanced, not too sweet, not too heavy and it just made for the perfect weekend sweet indulgence! BTW Lokuma deserves the title Cappo ti tutti Capi.... was it not for her infectious enthusiasm for baking extremelly challenging desserts, I would still be dreaming of eclairs! Grazie! Plodova Salata & Dona Domata, next time we get together we should try and repeat this recipe!